Yesterday was Day 19 for Pavelle and her sweet baby eggs and that means Lock Down. 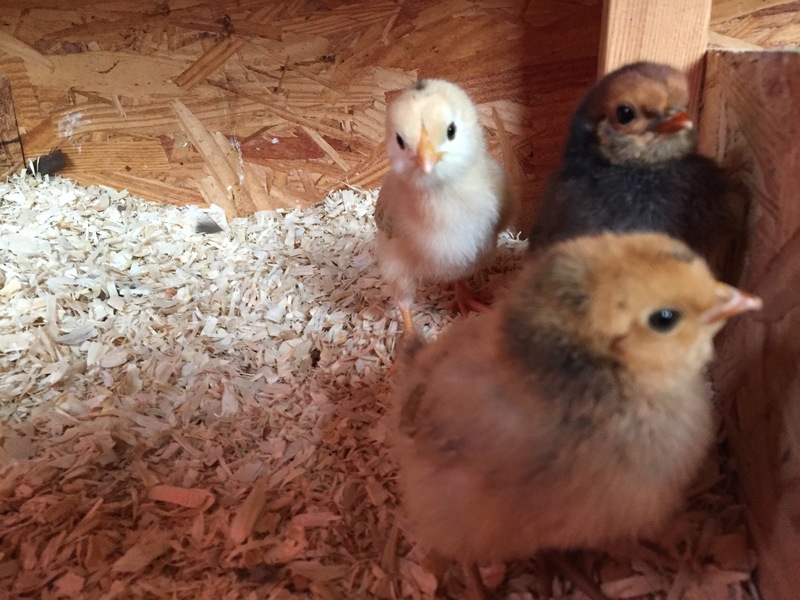 For those of you who do not know about hatching eggs, a chicken egg takes twenty-one days to hatch. 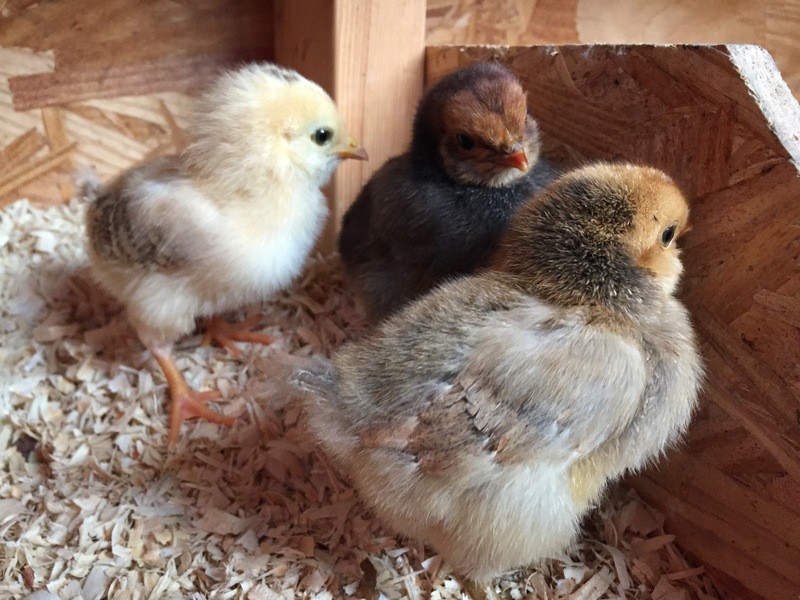 The last three days, Days 19-21, are what people who use incubators call ‘lock down days’ because under no circumstances are you supposed to open the incubator on those days, until the last chick has hatched. This is because in those last three days, the babies do the most growing in preparation to come out of their shells. When I let my hens sit on eggs, I make sure not to mess with them during those days, so they can do their own thing. Yesterday, I went to check for eggs and discovered that Pavelle had a brown egg sticking out from under her. She frequently steals other hens eggs from neighboring nests. 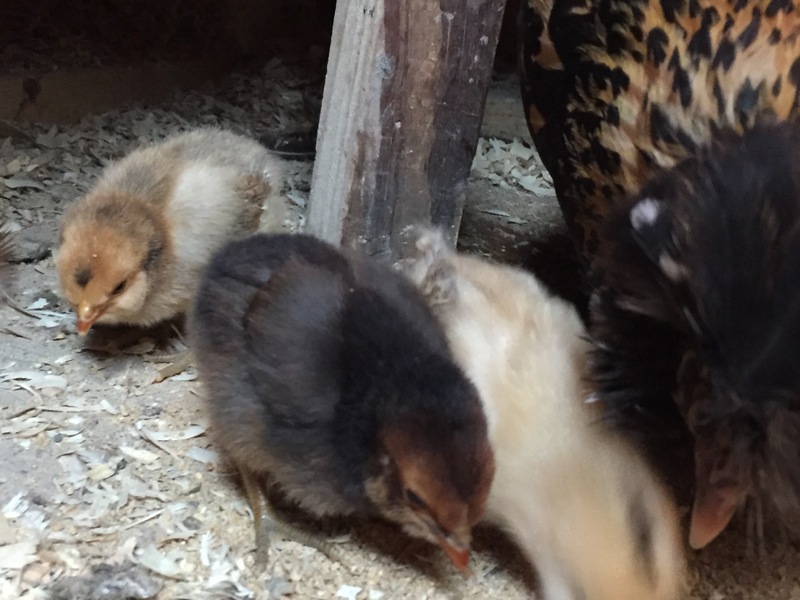 She had TWO brown eggs, actually… but was also missing one of her her six eggs. I didn’t see signs of eaten shell, but one of the brown eggs I had retrieved from under her had yolk on it, so I assumed the worst. 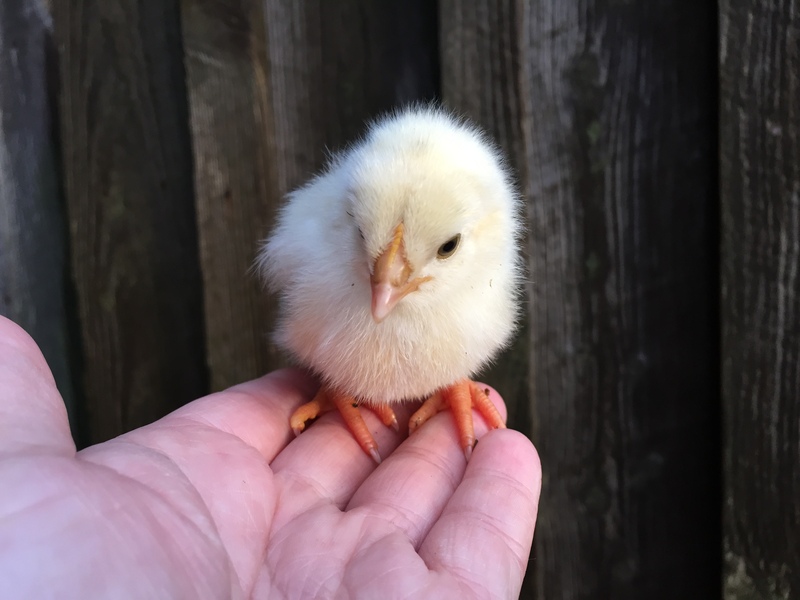 I found this little Easter Egger chick this morning, on Day 20. It is a bright yellow with brown/black on the top of it’s head, with puffy little EE cheeks. 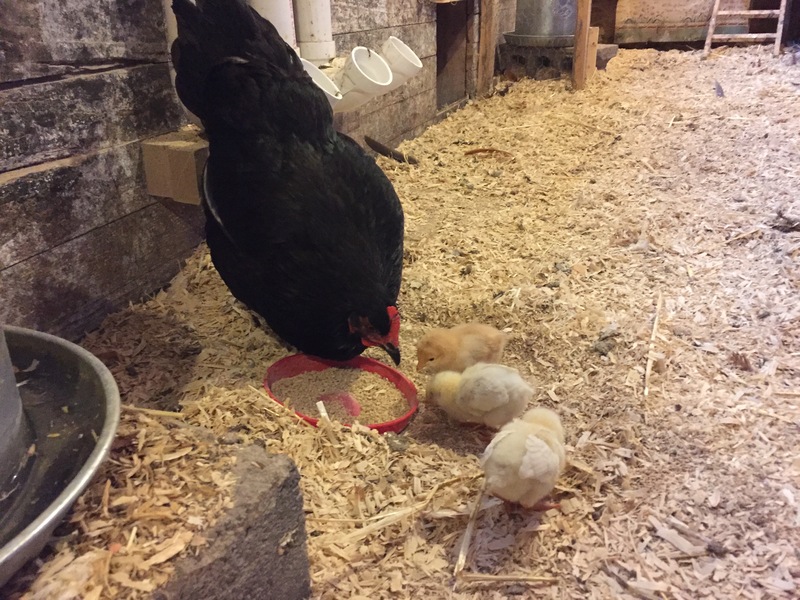 Pavelle actually had a total of three chicks under her this morning when I left the coop – two of her Pavlov-mix babies and one Easter Egger. There are two EE remaining. Given this is Day 20, and hatch day is technically tomorrow, I won’t worry too much about the other eggs until Wednesday or Thursday. Hopefully, at least one of the other eggs will hatch. The one is EE#2 and we all know I have been iffy about the contents of that one. 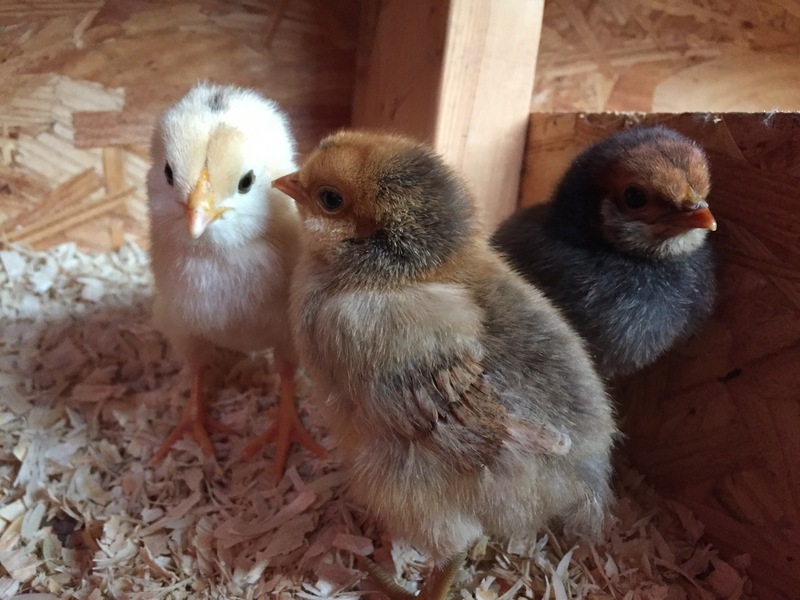 I’m used to having them hatch on Day 20 or 21. Day 19 might be a little too early? 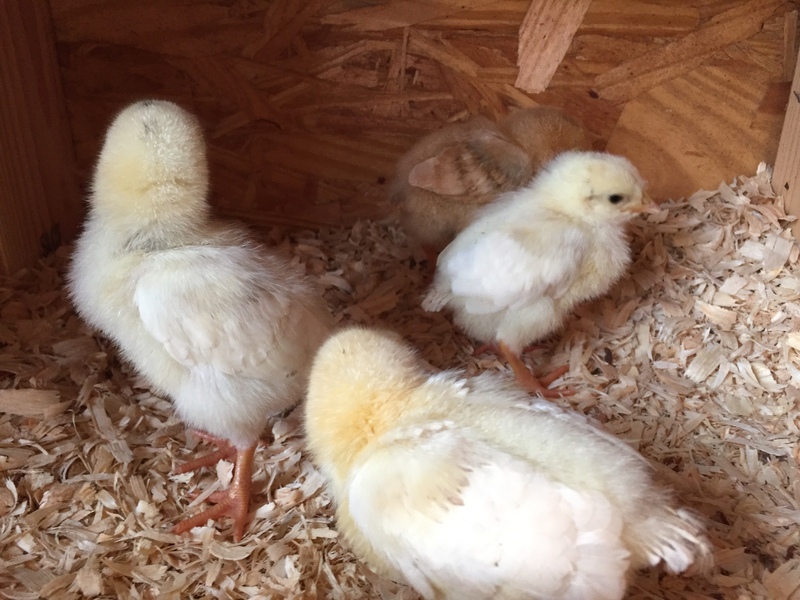 I will report back tomorrow with (hopefully) the last chicks and pics of all of them. Pavelle is a bite-y momma, so it’s hard to get pics of them right now. I have a lot of things to update on today. I’ll start with Abby. 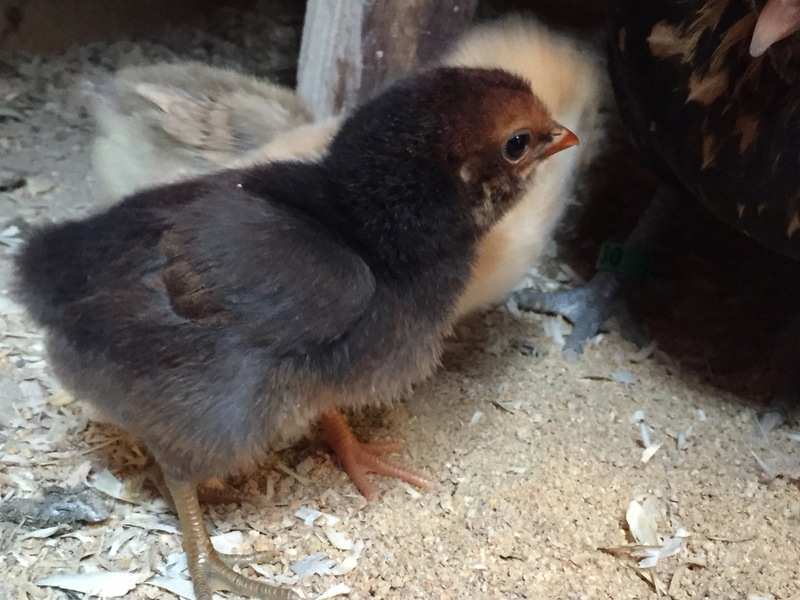 I reported earlier that she had gone broody while I was fussing over Ashley’s impending hatch date. 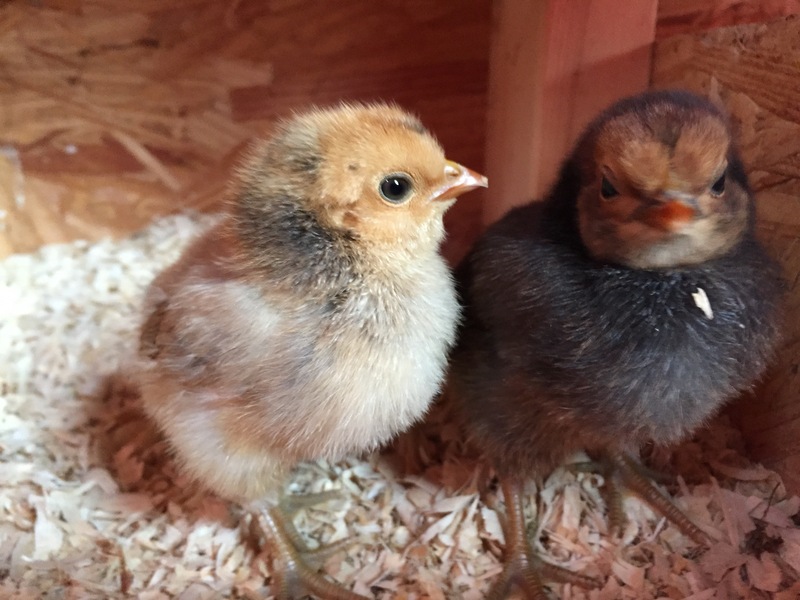 I decided to order her some Easter Egger eggs to hatch, and they came from My Pet Chicken last Friday. They shipped quickly, but got sent to the wrong post office, and almost went back to Harrisburg for re-distribution before I caught up with them. It would have taken another week to get them back, almost. Instead, I went to the post office they had been sent to, the next town over, and got them myself. Because there was no way I was making Abby stay on the fake egg longer than she needed to. My broody Abby, sitting faithfully on her fake egg. I replaced the fake egg with these pretty EE eggs. I LOVE the packing material it came in. So safe! I’m making a weird face. Abby looks perf. Winter is coming fast so her morning’s out will soon come to an end. Yesterday marked Day 7. Next Friday, I will candle them and see how they are doing. Hopefully, they all will be okay, despite their weird shipping ordeals and the late fall conditions. It’s been months since I first reported the oddity of Pacing Stacey. The situation has not changed. I’ve tried quarantining her, putting her in a smaller cage so hopefully she won’t pace (she did anyway). 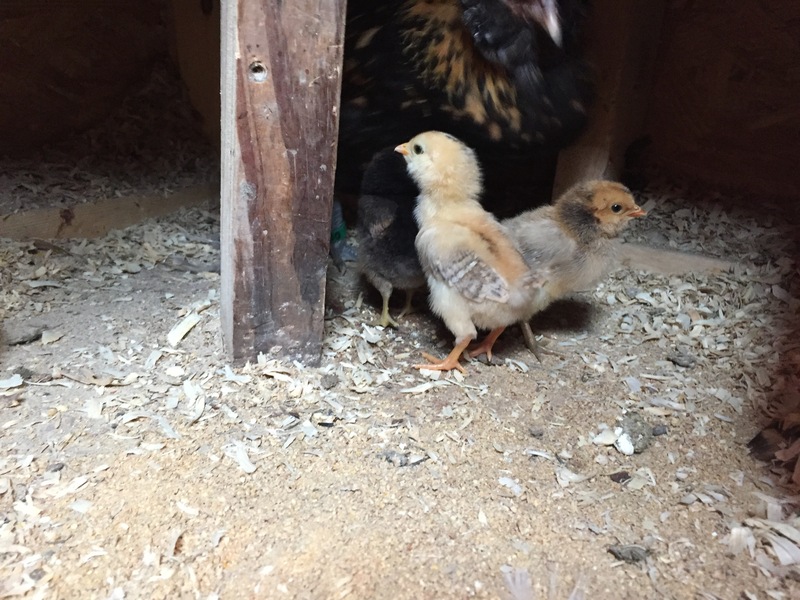 I’ve tried watching and frequently removing her from the coop. I’ve asked on-line for advice. And last week, I asked a vet. The vet was astounded and said she has never heard of that before. She is a chicken owner, too. We tossed possibilities around and then she said that IF I brought Stacey in, the most they could do was prescribe antibiotics and hope for the best. I told her I was thinking about euthanizing Stacey. She understood, but added that if I decided to keep her over the winter, to let me know how things progress. Stacey is still laying eggs. I’ve seen her. She’s lost weight, and while she’s not starving, she’s a considerable size smaller than her same-breed, same-age flock mates. She’s obsessive about this. Like OCD obsessive. The other hens are getting annoyed with her and have started pecking her when she gets close to them. I don’t see how #4 is going to change over the winter. 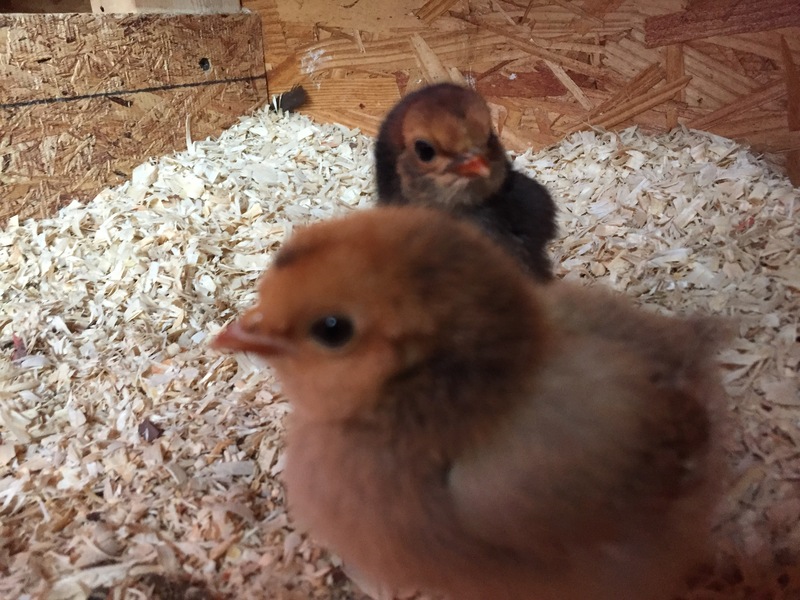 They will in closer quarters when they are trying to decide if they want to venture into the cold white and most of the older girls are molting. They are cranky. Stacey is annoying. It’s a BAD combination. Thus, I’ve decided the only course of action, after months of trying to figure this out, is to put us all out of her misery. Euthanize. Freezer Camp. Whatever you want to call it. I feel bad. I wish I knew something else I could do to take this away from her. Make her normal and happy again. Since I cannot, I must do what’s right for the rest of the flock. Freezer Camp has been scheduled for tomorrow. Stacey isn’t the only one to go. We will be saying good-bye to the Boys of Summer. Dani, Esther, Snickers, Sumi and Taller. There was a lot of debate in the last few weeks about keeping one of Abby’s boys. Esther was the only Easter Egger. But with Abby sitting on six EE eggs, chances of getting another EE roo are good, too. Sumi and Taller, the Sulmtaler Brothers are a rare breed. I tried to sell them online, but no one wanted them. Then I missed the animal swamp because of my daughter’s cross country meet. Apparently, there was someone there with same-age female Sulmtalers. 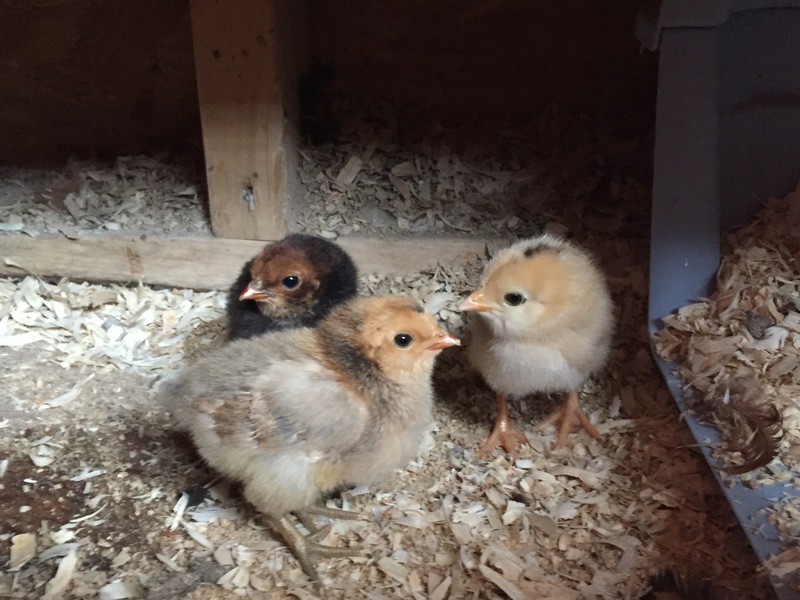 DH said I could keep one to breed with if I got a hen. I didn’t get the hen because I missed the swap. I might have kept Sumi anyway, except I accidentally terrified him a week and ago. It’s a short story. The temperatured drops so that it was switching between sleet and regular rain. He and Esther were hiding under the ramp. I tried to get them both into the coop, wearing my winter hoodie. He’s afraid of me now… like total full on freak out afraid. He flies into a tizzy if I get near him and runs away. Snickers is a big beautiful beastie, all chocolate brown and fluff. But he’s also a bit untamed and wild. Not mean, just untouchable. However, Dani is at 22 weeks and the rest of the Boys are at 16 weeks. 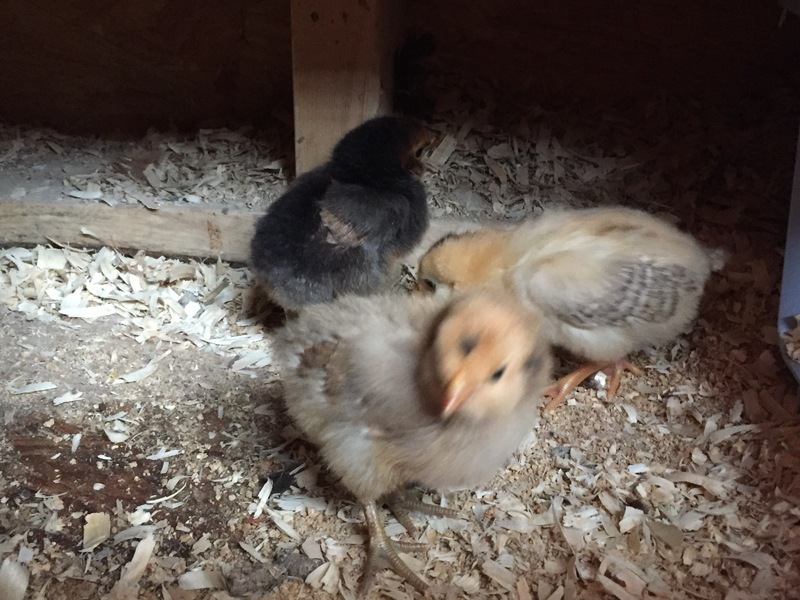 And, as noted, most the older girls are molting and cranky. Dots is molting and cranky. I have one little momma and four wee ones. And one broody sitting on six eggs,with two weeks to go. I found blood on the window ledge today where someone was scrapping with someone else. It’s time thin the flock. It’s time for Freezer Camp. So the Boys of Summer will be joining Stacey on her journey tomorrow. I’m REALLY going to miss them. We’ve been having crowing concerts the last few mornings and afternoons. Little roosters have such personality and do such amusing things. Not to mention being beautiful. Even Dani, who’s looks I wasn’t impressed with at first, has grown into a handsome, handsome mutt. He’s tall like his papa and brother, and looks like bulkier. Also, if we kept him, I think he’s more dominant than Pip. Pip is definitely NOT an alpha. Dani is. Snickers blends into the bushes here in the Club House. Esther does not. Esther. I don’t get many of him. He is not a boisterous boy. Sumi and Taller again. I really love how they look. Maybe someday, I will get more, and possibly hens. Here is a good video of Snickers and some of the boys. I took a few more yesterday and the day before, I’ll most them to my Instagram later. There will be available here… or via the sidebar on this page. Not many pictures of Stacey. All she really does anymore is pace. It’s sad. Well, Ashley pushed the last egg out of her next this morning, walked around and made an attempt to convince her babies to follow her outside. They did not. 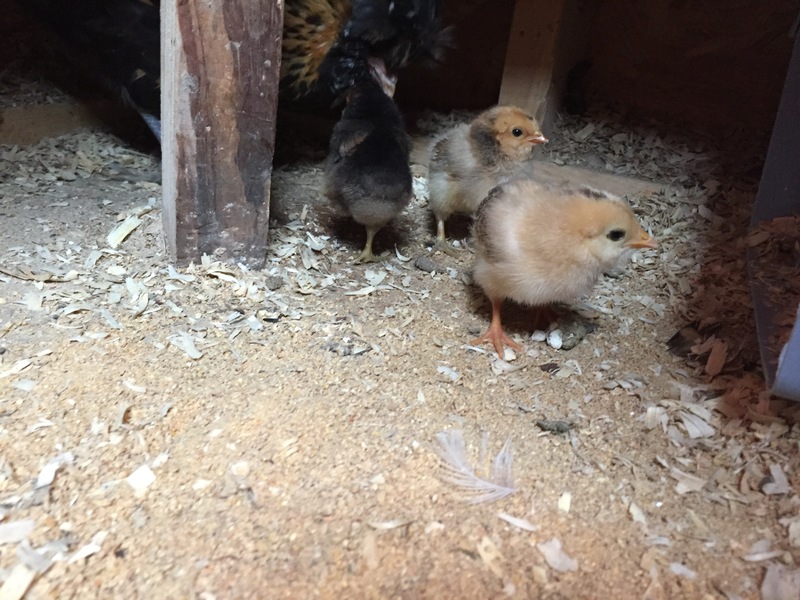 Assuming she was telling me that the last egg was not going to hatch, I removed it from the coop and got her and the four remaining babies some food and water. The other egg, the one she was trying to ‘help’ the other day… also died. I figured it would if it couldn’t get out on its own. 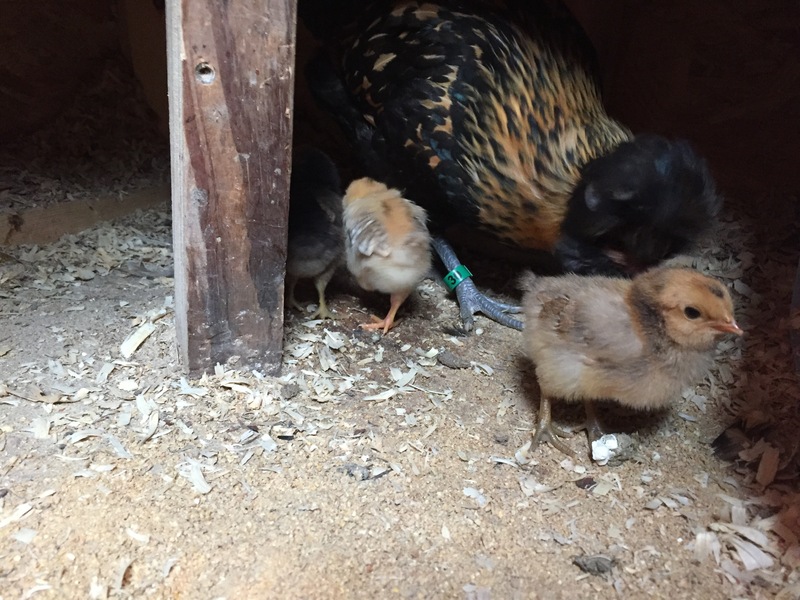 So Ashley has four little wee feather babies. Here’s a video of them from yesterday. I’ve removed them from the laying bed they were in and into the cat carrier. 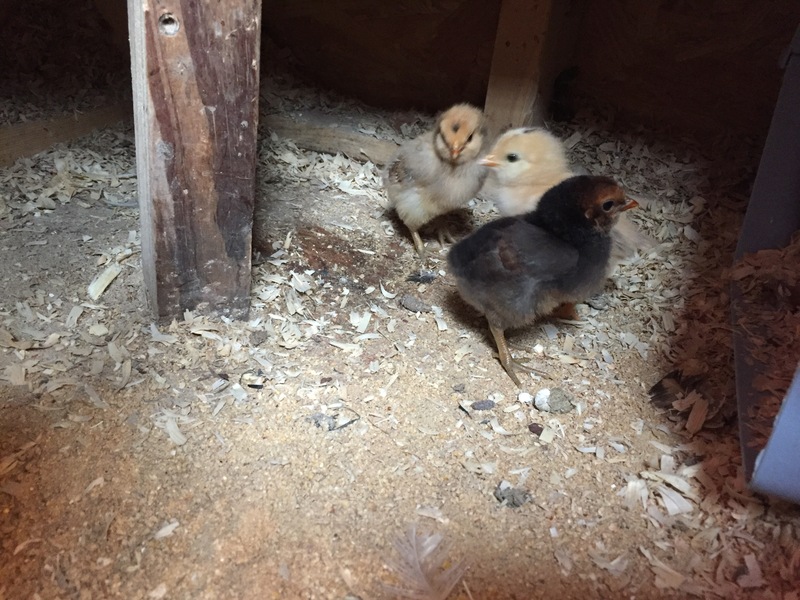 It’s a little snug for a bigger hen like an Australorp, but still a safe place for the Wee Ones to be.